So it’s not all that surprising that so far – hundreds of thousands of “Smart” Meters have been recalled and/or replaced throughout North America due to various reasons including fires, explosions, general failure, and measurement errors. There are utility companies who are already making plans to replace hundreds of thousands more. All over the world, concerned citizens, elected officials, and organizations have been fighting to keep “Smart” Meters out of their communities due to health, safety, privacy, and cybersecurity concerns. When they haven’t been able to completely stop utilities, they fight for the right to “opt out” of “Smart Meters” being installed on their homes and businesses. The capabilities of smart water and electric meters are astounding, going far beyond what consumers may normally associate with this technology. GreenTechMedia recently documented just how powerful these devices can be. “The cost of installing a smart meter is a] heavy lift no matter what the size of the utility,” George Hawkins, DC Water’s chief executive officer and general manager, told Bloomberg BNA. Now back to the hundreds of thousands that have been replaced and/or recalled already as well as the plans to replace more. This isn’t a complete list and it only includes examples from North America. 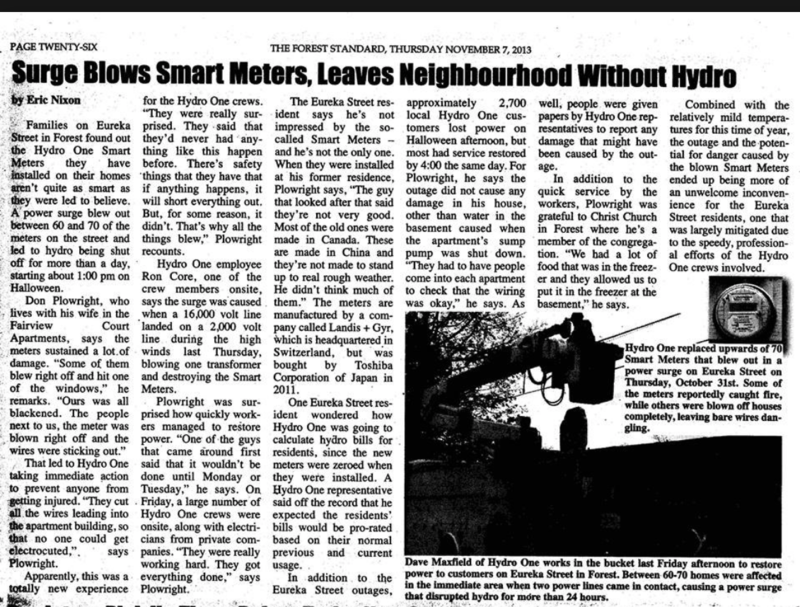 Problems are going on everywhere with these “Smart” Meters. Certainly there are people profiting from them but it doesn’t seem to be the consumers. “Big rig crash into pole leads to power surge in Discovery Bay” — Besides the exploding SmartMeters, one resident told us smoke and some flame was shooting out of the outlets inside her home. As Naperville gets ready to retrofit up to 4,000 homes each year with new electronic water meters, the city’s water director stressed that reading the meters remotely is not cost effective and workers will continue going home to home to retrieve the information. The city is preparing to purchase Sensus iPerl water meters to replace aging and less-accurate mechanical meters. The first 4,000 should be installed in the fall, and the rest would follow at a rate of 4,000 annually until all 43,000 in Naperville are replaced. November 2016: “LADWP Accidentally Overcharged Its Customers By At Least $67.5 Million”: After LADWP installed the PricewaterhouseCoopers designed billing system, customers almost immediately began finding bogus fees and overcharges on their utility bills. Four separate individuals filed class-action lawsuits against LADWP, all of which were eventually merged into one single case, according to KPCC. January 2017: Duke Energy Ohio rate increase proposal with $143.4M earmarked for replacing 700,000+ AMI “smart” meters installed between 2010-2015 due to depreciation: http://dis.puc.state.oh.us/CaseRecord.aspx?Caseno=17-0032&link=DIVA (See testimony of Donald L. Schneider Jr. filed on March 16, 2017 on behalf of Duke Energy). The new meters will replace not only old analog mechanical meters, but also first-generation smart meters deployed in past years by Duke Kentucky as part of a pilot project. Those meters communicated with a central office using signals sent on power lines, a system that Duke Kentucky said had technical limitations. The system had a ten year warranty and now more than 6000 of those smart meters no longer give out a signal. The parish CFO Ross Gonzales estimates by the end of the year more than half of the registers will no longer transmit a signal. “Memphis Police Association Petition and Request for Forensic Audit and Ethics Review Includes Wireless Smart Meters”. The association has 2000 members. Original one-way transmitting analog meters lasted on average 40 years and they didn’t have these problems.